Meng Ding Gan Lu (Honey Dew of Mengshan) is one of the best Chinese Green Tea we would like to recommend to our customers. 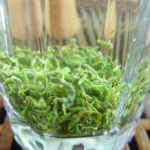 It is the green tea with typical flowery fresh flavor and sweet mellow taste. And there is no bitterness and astringency of it, even from the last sip of bottom cup. Our Meng Ding Gan Lu comes from the tea garden in Mengshan with altitude around 1450m. And the cultivar is the seed growing Xiaoye Lao Chuan Cha. 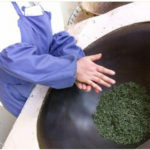 The processing follows the classic traditional processing, especially the ‘Three times Frying and Three times Rolling’ and the charcoal heat baking makes the outstanding quality of this tea! 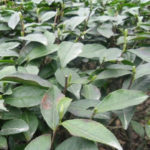 The tea garden conforms to natural farming. It can meet EU-regulation. 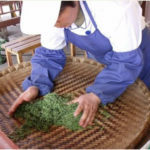 Meng Ding Gan Lu is the green tea from the Mengshan Mountain of Sichuan province. 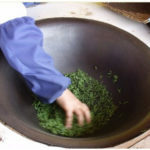 It is one of Top Ten Chinese Famous Teas. 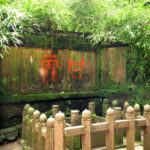 Mengshan (蒙山) is one of the oldest places in China recorded to plant tea. 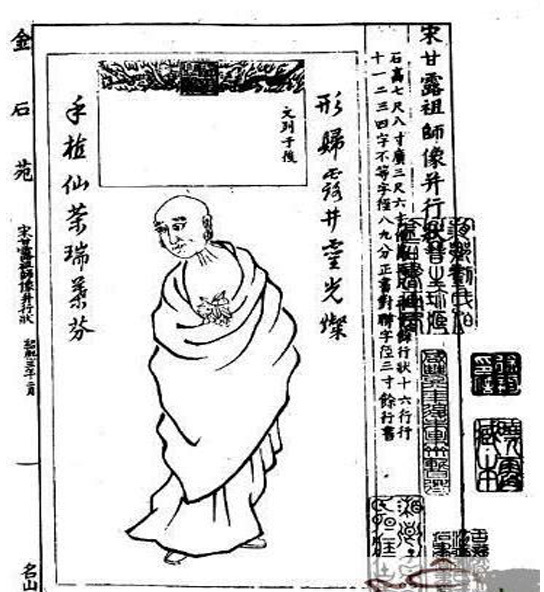 Monk Wu Li Zhen (吴理真) was there to plant tea in around BC200. 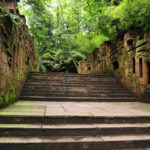 Later in Song Dynasty, he was officially memorized as Tea Ancestor (茶祖)．and the tea garden he built was preserved and named as Imperial Tea garden (皇茶园). 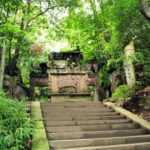 The tea produced in this garden was the tribute tea to the imperial family in all-through Song Dynasty. Gan Lu literally means ‘honey dew’ in Chinese. While actually it is a Chinese word originated from Sanskrit which means ‘immortal’. 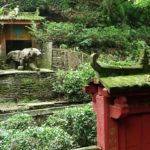 In the past there were many temples in Mengding Mountain, and the monks were the pioneer to produce this tea. It’s imaginable that they use Buddhism language to name this tea. The Top grade Meng Ding Gan Lu is made by the earliest single buds germinated in Spring. And the traditional processing of this tea is very onerous. Generally it needs three times of frying and three times of rolling. 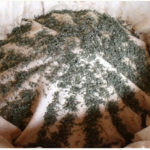 And charcoal heat is necessarily used to baking drying of this tea. The fine tea material of Megnshan and the exquisite processing make the tea very fruity flavor and tender pure sweet taste. 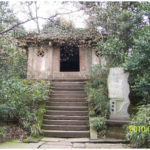 The stone house, where Monk Wu Li Zhen ever lived. 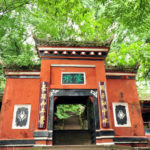 Imperial Tea Garden (皇茶园). The imperial stone tiger is still aggressively wacthing out the tea garden. This is the earliest germinating tea buds to make top grade Meng Ding Gan Lu. The fresh buds and leaves were put on the ground in thin layer for slight withering. 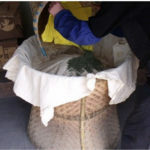 The traditional hand-made processing of Meng Ding Gan Lu is very refined and onerous. it requires very skilled work of the worker. and the daily output of worker is very limited, just 2-3 kiloes at maximum. 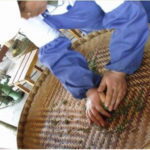 Anyhow please remember the best quality tea is always hand-made one. 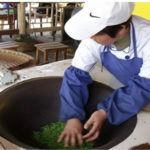 The processing of Meng Ding Gan Lu is featured by three times frying and three times rolling (三炒三揉), and charcoal heat baking dry. The following is the whole hand-made processing steps. The next handling after frying and rolling is body shape making. 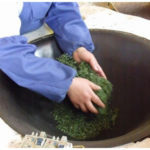 Just before the tea is almost dried and the leaves are still hot and soft, we use hand to make the tea body shape of what we want and bring out pekoe. 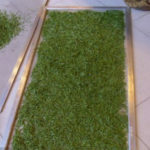 Immediately after this processing the tea leaves is dried, thus the body shape is fixed. 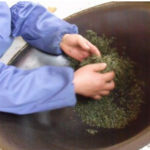 The last handling is to bake dry the tea. 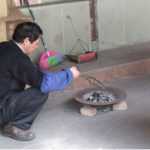 Traditional baking of Meng Ding Gan Lu is by charcoal heating. As Chinese experienced, wooden charcoal heat always make better food than electric heating. 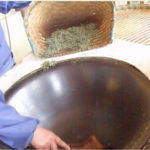 Around one kilo of tea was put on the surface of bamboo basket evenly in thin layer. And charcoal was burning under the basket, smoke is definitely prohibited. This is a brewing of Meng Ding Gan Lu. 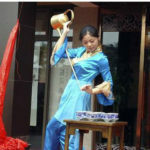 Artistic tea brewing ceremony in Chengdu of Sichuan province.